The human body is composed of approximately 75% of water, which obviously means that water is a crucial component of the human body. Water is so beneficial, so easily available, so free, and yet so easily overlooked. Whether you want a younger skin, shinier hair, a healthier body, or all three, drinking water can give you all this (and even more). So from now on, don't medicate, hydrate!! 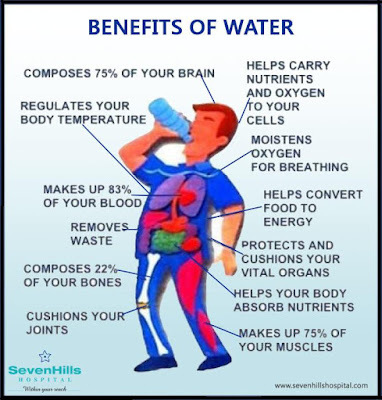 Benefits of drinking water and staying hydrated. When the intake of water (and other liquids) is lessened, it results in dehydration. ‪Dehydration refers to a condition wherein there is a deficit in the level of ‪‎water in the body resulting in disruption of metabolic processes. Disruption of metabolic processes leads to an imbalance in the functioning of our system, and eventually, leads to an unfit and unhealthy body. 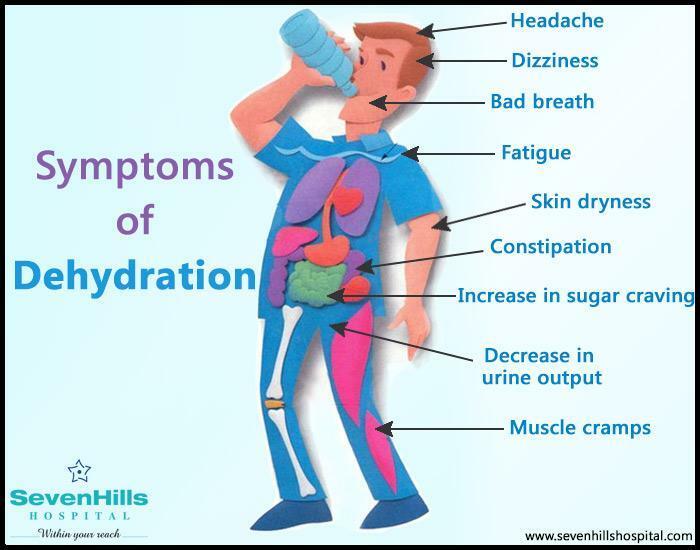 Explained in the image below are some of the major symptoms of dehydration. Dehydration is simply a reduction in the level of water content in the body. Treating dehydration doesn’t always require popping in antibiotics or visiting your local doctor. By changing your lifestyle as suggested below, you can easily hydrate your body and live a fitter and healthier life as before. In addition to having more of liquids and wearing loose and light-colored clothing, make sure to adopt the below to beat dehydration. Water offers to you all the benefits shown as above. So make sure you drink enough water during the day, especially before, during, and after your workout sessions. Coconut water has minerals and vitamins and drinking one glass of coconut water daily helps in hydrating your body and maintaining your body temperature. Alcohol causes severe dehydration and hence must be avoided before, during, or after exercising. Exercising when you have a hangover should also be avoided. Spraying cold water using a spray bottle helps in controlling your body temperature. Spray cold water on your neck, wrist, and on the temples of your head to keep your skin well hydrated.